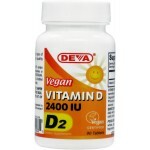 Deva Nutrition is excited to introduce its higher potency Vitamin D supplement that provides 2400 IU of vegan suitable vitamin D per tablet. 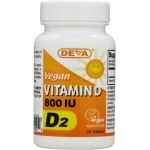 Scientists have found that people who live in cool climates -whether omnivore, vegetarian or vegan- are more prone to vitamin D deficiency due to insufficient sun exposure. Scientists have found that people who live in cool climates -whether omnivore, vegetarian or vegan- are more prone to vitamin D deficiency due to insufficient sun exposure. 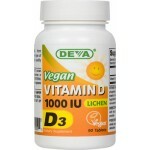 Deva Nutrition is excited to introduce its lichen plant derived Vitamin D3 supplement that provides 1000 IU of vegan suitable vitamin D3 per tablet.